As you have watched people playing guitar, you may have seen them put a small clamp type device on the fretboard. This device is called a capo. It raises the pitch of the open strings, effectively moving the start of the string to wherever the capo is positioned. Ukulele players also have this versatile tool as an option. A ukulele capo performs the same task of increasing the pitch of the open strings. Though, the real benefit of a capo is that it can make songs easier to play and add a new musical dimension to your playing. “Capo” is a shortened form of the Italian word “capotasto,” which means “head of fretboard”. There are two different pronunciations, “cap-o”, or “Kay-po”, both of which are used interchangeably. To use a capo, just clamp it onto the fret that corresponds to the key or pitch in which you want to play. Many beginners make a similar error, they place the capo directly on top of the fret, which can create a terrible buzzing noise, reduce the sustain of the notes and over time may damage the strings or frets. When placed correctly, the bar of the capo should be behind the fret in which you are playing. You should be able to see like to see about 1/4 of an inch between the capo bar and the fret. It doesn’t have to be precise. Just strum the strings and reassure yourself that they are correct pitch and no buzzing is heard. Make sure the capo is in line with the fret, and not at an angle. Experiment until you find the best position for your ukulele. One key point to note is that if you place your capo too close to the fret, it can overstretch the string. This leaves notes sounding sharp and out of tune with other players, which is probably the worst scenario. When using a capo, the sound coming from your ukulele will be one note higher for each fret covered by your capo. That is, if you placed a capo on the third fret of your ukulele, it will raise the pitch by three semi-tones (from C tuning to D# tuning). You can play the same chord shapes, but they will have a higher pitch to them. When deciding if or how to use a capo, the key considerations is what you are trying to achieve musically. Capos can be used for many different purposes. Ukuleles are famed for the tuning variations. 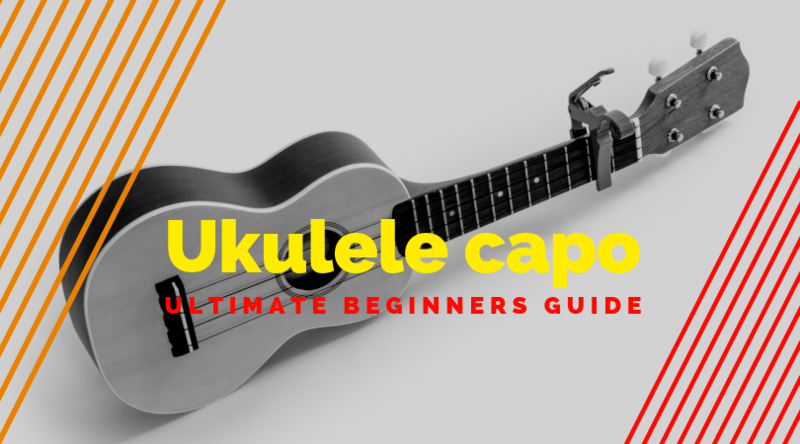 If your ukulele is in standard tuning, or C tuning as it is also known (i.e., the strings are tuned to G, C, E, A), by placing the capo at the 2nd fret will create the open notes of A, D, F# and B. These are the same notes as English and Canadian tuning (which are both forms of D tuning). The key of a song is normally set according to the vocal range of the singer. Therefore, if a song originally recorded in the key of D is too low, a capo could be placed at the 2nd fret and the key of the song will now be in the key of E, which is one tone higher. A key change for a bridge or a final chorus can help to lift a song. This method has been employed by songwriters from the beginning of time. Having a quick-change trigger capo can enable that key change to happen with minimal effort and without needing the change chord voicings. If you are a beginner, or struggle to play barre chords, but need to play a song with the chords D#, A# and G#, then you will struggle. However, you could place a capo at the 1st fret and play the chords D, G and A; it would create the same musical notes as if you were playing the barre chords. As you develop, you will gain new skills and dexterity, but this takes time. If you want to strum along to some of your favorite tunes, a capo can help to put the ukulele into a key with easier chord shapes. Even once you’ve mastered the harder chord shapes, you can still use a capo. Sometimes I choose to use a capo, just because I think it sounds better on some pieces of music. A capo can make it easier for you to change the pitch of a song to a higher key. If, for instance, you know a song in the key of D, but someone else is playing in the key of E, by placing a capo at the 2nd fret you’ll be able to play along while playing the chords you already know. Or alternatively, if you happen to be playing your ukulele with a friend, slip your capo on and use different chord shapes. For instance, if they are playing a D chord, you can play a C chord with a capo at the second fret. The sounds coming from your ukuleles will be very similar, but not the same. These two chords played together will create variety and provide a richer and fuller sound. There are a variety of capo types to choose from. Trigger capos are the most common style of ukulele capo. They have two leavers which are pushed together with a tight spring. It is this spring which applies the tension to the levers and pulls the strings tightly against the fretboard. The most famous brand in this style is Kyser. They are exceptionally well made and can be applied one-handed. Kyser refer to them as ‘quick change’ capos, which is certainly true. I have seen these capos adjusted mid-song to either change key or to add an additional dynamic to the tone. If purchasing this type of capo, quality is essential, as the spring needs to create the right level of tension for the instrument. Shubb released the lever style capo in the 1980s. It provides the perfect balance between adjustable tension and quick application. The lever is used for fast placement and removal, with the thumb screw providing the fine-tuning benefits which are not available on trigger capos. Two rubber surfaces hold the capo in place, which reduces the risk of string slippage. Lever capos can be applied one-handed, though repositioning is certainly not as fast as the trigger capos. I own and regularly use Shubb capos; they are small, unobtrusive and do not get in the way of the fretting hand. Which is important on a ukulele as space is already quite tight. The elastic capo uses a plastic bar to hold down the strings, with an elastic strap which wraps around the neck of the guitar. The tension can be adjusted by using the different eyelet holes. Difficult to apply and certainly cannot be placed or removed with one hand. Over time the elastic will degrade in quality, stretching the elastic and reducing tension (though it is possible to add a half or whole turn in the strap to gain a bit of extra tension if necessary). Difficult to get the perfect level of tension. I do not recommend this type of capo. For me, the negatives certainly outweigh any benefit gains from the low price. Sometimes, capos sound bad. But don’t go blaming the capo too quickly. Often the problem is caused by your ukulele. If the action (distance between the strings and fretboard) is unusually high, it will be more difficult to place a capo accurately). The same goes for a lower action. A good capo cannot make up for a poorly made ukulele. Cheaper ukuleles with badly placed frets or bad necks will make it difficult for you to use a capo. The budget models are the most likely to suffer from intonation problems. So, even as a beginner, I recommend buying as good a quality ukulele as you can. Until you have learned all the chords you may encounter, using a capo may make it easier to play the songs you love. Obviously, you should try to learn each chord you come across, study the chord diagrams and practice finger placement. Eventually, muscle memory takes over and the chords don’t seem as hard, but until then grab a capo and have fun. As a ukulele player, you should make use of this versatile tool. Capos are not expensive, so feel free to get a few and decide what you like.